In a past post we discussed the benefits of TM-Town’s easy automatic alignment tool. Today’s post will go over some additional features you can take advantage of when you align source and target documents on TM-Town. 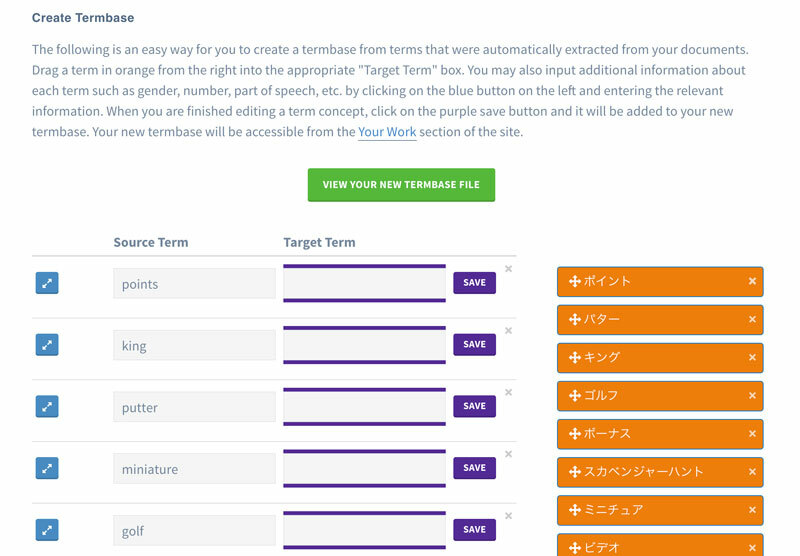 TM-Town’s terminology tools are one more way that you can unlock the value of your linguistic assets so that you can better leverage them for your next translation job. TM-Town will automatically extract key terms from both your source and target documents. These terms will be ranked according to an algorithm that calculates each term's relevance within the document. This is done through statistical algorithms and natural language processing technology that analyzes the content of your document and identifies the most relevant keywords. A higher Term Rank score indicates a higher relevance within your document. Term extraction is just the beginning. What is really useful for translators is a multilingual glossary (i.e. a source term in one language and it’s equivalent translation in another language). TM-Town now has a tool that allows you to easily create a multilingual termbase that can be exported to use in your favorite CAT tool in TBX format. TM-Town’s system automatically extracts the top terms (using the Term Rank algorithm) from the source text. TM-Town then extracts the top terms from the target text. 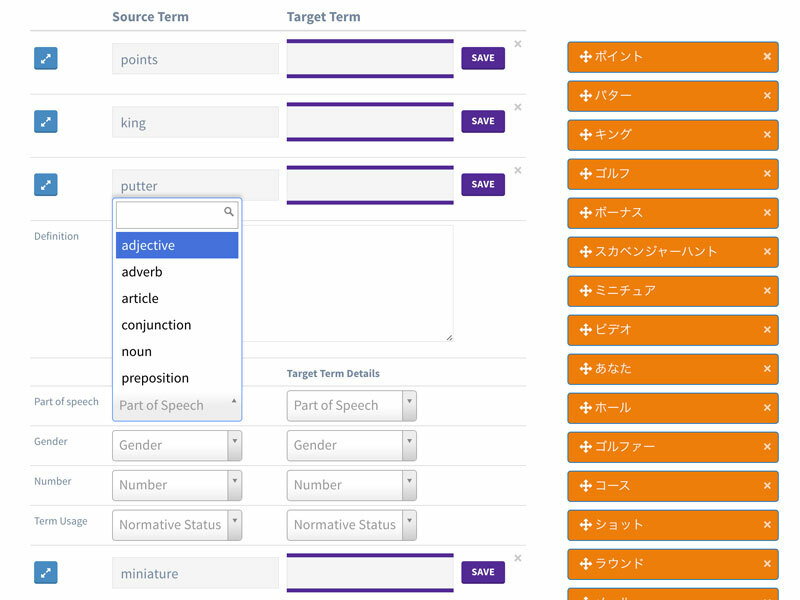 With a simple drag and drop user interface, TM-Town’s new tool allows you to quickly match the source term to its corresponding translation. You can also add additional data to your termbase such as the gender, number, part of speech of the term as well as any definitions. As you are matching the terms, TM-Town’s system automatically creates an industry standard terminology file that you can export in TBX, XLS, and CSV. TM-Town has taken the painstaking work out of creating a multilingual termbase. It is now a simple, stress-free process. The majority of the work is done for you automatically through TM-Town’s system. Drag a term in orange from the right into the appropriate "Target Term" box. You may also input additional information about each term such as gender, number, part of speech, etc. by clicking on the blue button on the left and entering the relevant information. When you are finished editing a term concept, click on the purple save button. This demo will not actually save anything, it's just for fun. However, in TM-Town a new termbase file will automatically be created for you which you can then download to use in your favorite CAT tool. Interested in trying out this tool on your own documents? Register today and get immediate access to this tool and many more for free. I am excited about the possibilities presented by TMTown, and your termbase creation interface is great. However, there are some terms that it did not automatically pick out that I want to include in my glossary. Should I go through CafeTran to manually pick terms ? Or is there a better way? Japan Posted over 3 years ago. Thanks for your comment! You can manually add terms to a glossary on TM-Town by using the Term Concept Editor/Viewer. To access this first click on your glossary from the "Your Work" page. Under the "Terms" tab you will see a link that says "Click here to view/edit term concepts in this file". From there you can edit your glossary and its associated data or add new terms to the glossary. For more details, see this video starting at 1:23 (https://www.youtube.com/watch?v=1jFLT9NYsLQ). Another option would be to use CafeTran to create the glossary and then upload it to TM-Town. Michael Beijer, a CafeTran user has some good videos on powerful term extraction tools that you can use in concert with CafeTran (https://www.youtube.com/channel/UCCI8HIBMnls7tr2xSweWjRg/videos). Portugal Posted almost 3 years ago. Japan Posted almost 3 years ago. I would recommend this blog post which shows how to upload a multilingual Excel or CSV glossary to TM-Town. Once you have done that, you could make your glossary available on the TM-Town Terminology Marketplace by following this blog post.